“Salsa!” Exhibit Spices Up Eastern Washington! Members of the Contemporary QuiltArt Association, including many WA SDA members, opened their juried show “Salsa!” in Tieton WA on Memorial day weekend. The exhibition includes art cloth, quilt art, and several sculptural fiber pieces. 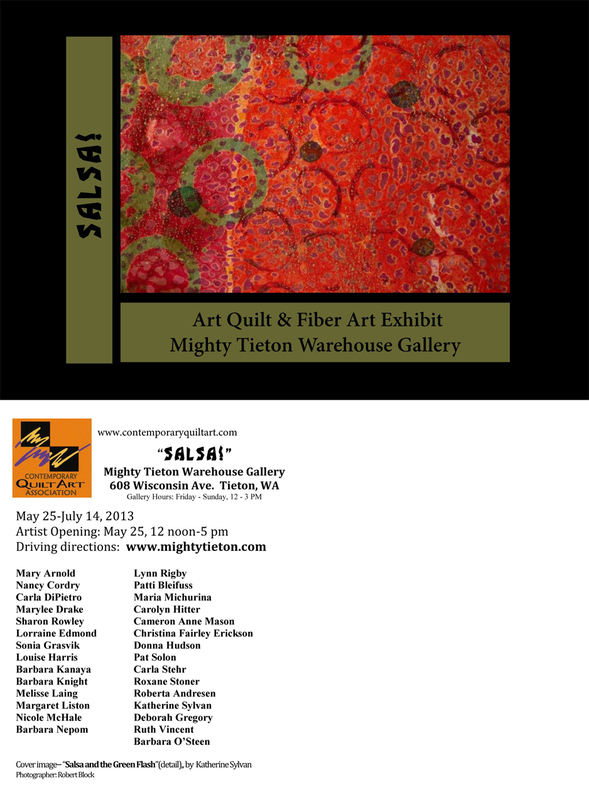 The Mighty Tieton Warehouse Gallery is located at 608 Wisconsin Ave, Tieton, WA (about 15 miles from Yakima) and is open Fri-Sun between 12-3 pm. The show will be running through July 14. As part of the festivities, there are several outdoor textile installations, and two upcoming “monster felting” parties on June 29 and July 14 with master felt artist, Janice Arnold. And if you can’t make – although you really should, here are a few shots courtesy of SDA member, Christina Erickson. If you are having trouble viewing this in your email, you will be able to view it on the web by clicking HERE. This entry was posted in Exhibition and tagged CQA, Janice Arnold, Mighty Tieton Warehouse Gallery.